By using your AgentPro dashboard you can search by developer, development name, location, price, minimum bed, and bathrooms and have access to all information such as price lists, brochures, floor plans, developer/promotor contact details, and what is most important when the information was last updated. The Iframe Pro and Microsite versions will even allow you the change the title, description and featured image of the development. For your convenience all this information is included in the email the system sends you when a visitor has filled in an enquiry form. Our easy to understand instructions will assist you to be up and running with AgentPro’s ‘new developments’ feed and back office in a matter of minutes. You will have all new developments on the Costa del Sol shown on your website instantly. Our multi-lingual support team will talk you through the process of getting started and will explain how to use the AgentPro dashboard. If you wish we will insert the code on your website at NO charge. Simply paste our code on a page on your website and the job is done. Your web designer can easily modify the look and feel of your ‘new development’ pages by customising the CSS. This feature allow your visitors to create a wish-list when they are browsing through the new developments. Search our developer & development databases, download images and documents and modify your settings and preferences. You can select the developments that you want to show on the top of the page by making them featured. Visitors can print the developments in PDF format with your logo and contact details. Create E-Brochures of selected developments in PDF format. Any ‘new development’ you do not want show on your web pages can be disabled with one simple click. 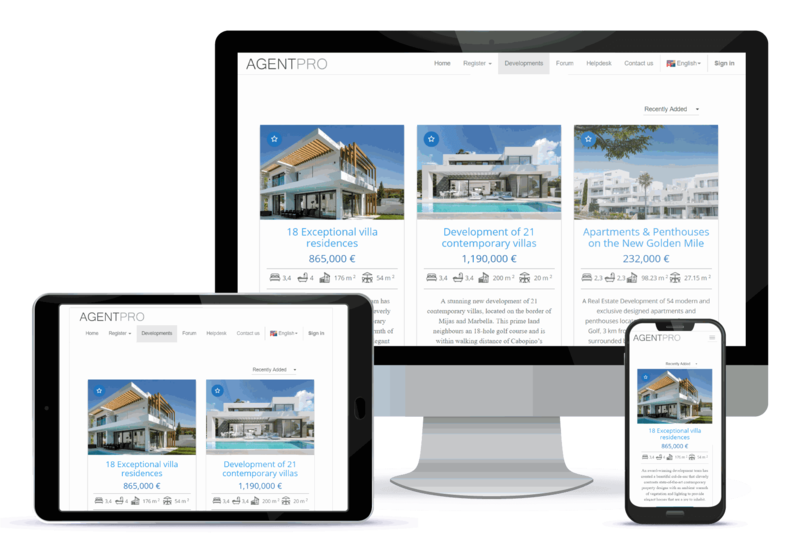 InnoTech has an exclusive agreement with AgentPro to build micro-sites using AgentPro’s XML Feed. These can be published as separate domains or sub-domains. The cost for an XML license is the same as the Iframe PRO product. The cost of hosting and web design starts from €275 per year and includes 5 free webmaster hours.